If this year's title destination seemed inevitable, the Austin weekend thus far has done little to alter that status. Yes one does not get rich backing against Lewis Hamilton at Austin's Circuit of the Americas. But even so the extent of his advantage stunned, not least as Mercedes on pure pace this time looked ahead too. 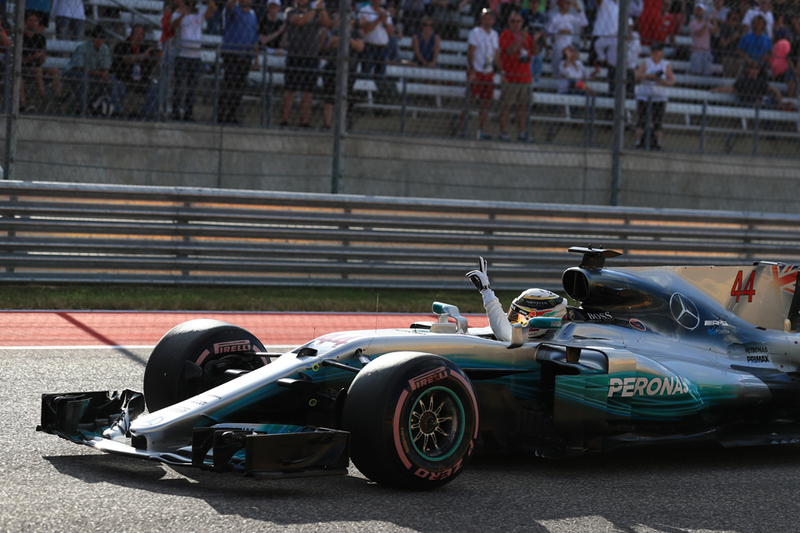 And Lewis, as if leaving nothing to chance on any front, has topped every Austin session. Including in qualifying. He cruised to pole with minimal rancour, his first effort in Q3 - even with a derate - good enough by a way. "He's moved onto a different plane since the summer," noted an observing Pat Symonds. Lewis also took up the subject. "I feel fantastic. 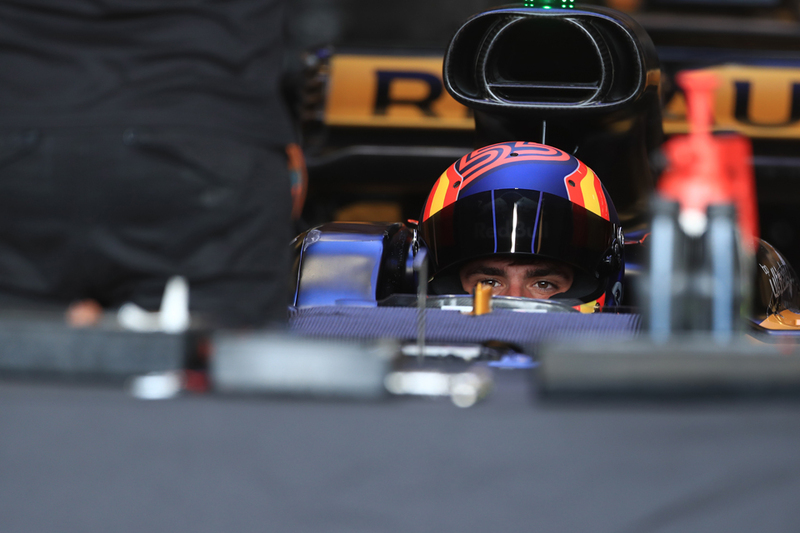 I feel fresh and healthy and wish qualifying would go on longer," he said. "The last lap was not spectacular, but up until then very, very strong. "The track was very difficult today with the wind picking up, you've got a head wind down to turn one and through the fast section there was a tail wind, then a head wind through the nine - it was shifting through the lap." "But that's why I love this track. It's a great circuit to drive especially with a car like that." His team mate Valtteri Bottas has looked in something like better form this weekend, but even he with the same wheels got nowhere near. 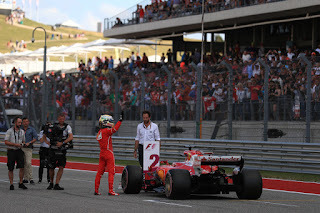 He wasn't even next up in the end either, as one Sebastian Vettel in that way of his salvaged the maximum at the last. 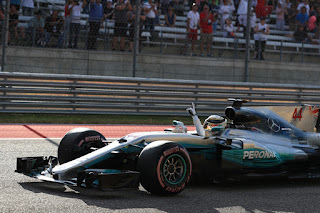 He snatched second place a quarter of a second off Lewis's best and splitting the Mercs; then neither Merc improved on their own final efforts (possibly due to sub-ideal out laps). "I'm very happy in the end but I was lacking a bit of rhythm with the wind," Seb said. "But I got it right when it mattered at the end. It's important to get the front row because I believe our race pace is really good." Ferrari has of course been fast but fragile in recent times (a lot of the reason Lewis's title looks inevitable) but today appeared to have traded. The glitches were gone but so had some of the Merc-bothering pace. The other Ferrari, piloted by Kimi Raikkonen, starts fifth having been ahead of Seb for much of the quali hour, but as also is a habit he diverged from him at the vital last. He slipped behind Daniel Ricciardo too - although by dint of setting an identical time to him but later. Ricciardo starts fourth. 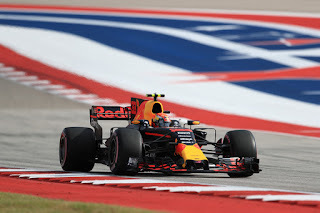 The other Red Bull man Max Verstappen was sixth in the order, in what he called "one of the worst qualifyings of the year", after errors. He knew he was on a hiding to nothing, with 15 to be added to his grid slot due to engine penalties. He in that usual way of his made things interesting though and will start on more durable supersoft tyres tomorrow, having got through Q2 on them. 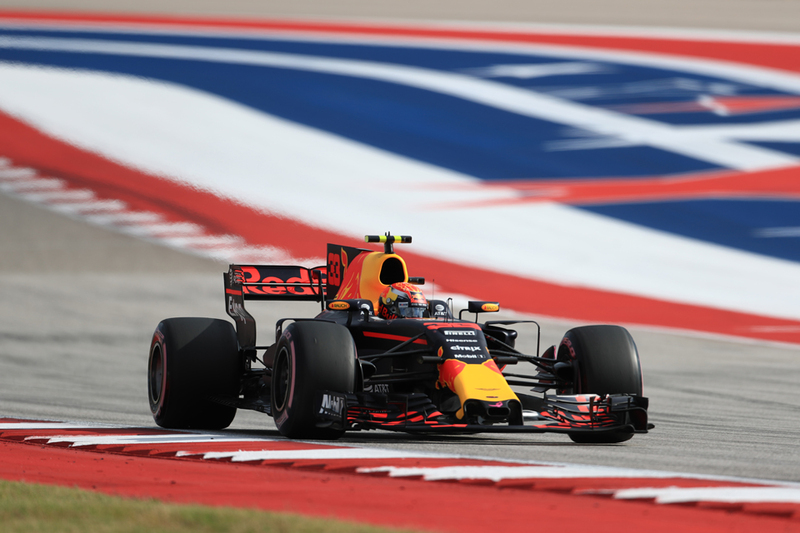 He is one of several to be penalised - Stoffel Vandoorne adds five to his qualifying place, Nico Hulkenberg 20 and new boy Brendon Hartley is welcomed to F1 with a +25. 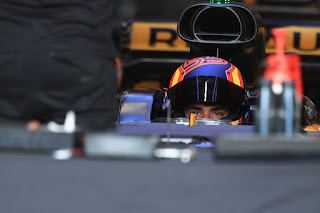 Of the new guys, Carlos Sainz (although hardly new) quickly got down to business in new Renault colours, and into the top ten, and he'll start seventh after Max's penalty. It's also the first time this year Hulkenberg's been out-qualified by a team mate, though Hulk didn't do Q2 what with his penalty. Hartley missed out on Q1 progression by half a tenth, and was eight tenths off Toro Rosso team mate Daniil Kvyat's best at that point. There were other worthy efforts - the Force Indias once again were best of the rest but unusually there was clear air between them. Seventh-converting-to-sixth starter Esteban Ocon once again is ahead, but this time by three places and half a second over Sergio Perez. Checo blamed only getting one run in Q3, a consequence of being baulked by Kevin Magnussen in Q1 and having to use an extra set of tyres. Fernando Alonso also got into the top ten, in his case with a Q2 effort that even he reckoned was near the maximum. He starts eighth. Even with the inevitability, Lewis probably won't make the championship final this weekend, short of more Ferrari unreliability. But if something can become more inevitable, this weekend it's happening.